Since last fall, the U.S.
ally mandated quota of 25,000. Boucher. He affirmed the U.S.
"Terrific, it's a good thing,"
dom as we celebrated our own. as Business Editor of the Ft.
honor of this year's fundraising success and next year's leaders. Silverman, incoming Hunters Run Campaign Chair. thirteen. $10, and children under 5, free. consent of the nominee shall be obtained. Carol Greenbaum and Angela Lampert. program will begin at 5 p.m.
ticed for thousands of years. Sunday, April 16, 1:30 p.m.
time to reach out to the community and embrace Jewish lives. organized such a successful event. *We apologize if we omitted any names from the list. state of war in the Middle East. found among the Israeli side, as well. need be respected in the workplace. tated that he work on his Sabbath. tively on Jew and Gentile alike. Published Weekly October through Mid May Bi-Weekly balance of year (42 issues! Grow Up To Be Doctors." raising appeal on its head. port for the Jewish state. phone, asking for your dollars. created it must be dealt with. gees come in different styles. receive a set of the Encyclopedia Judaica. marked its 60th anniversary this month. policy as a charitable deduction. Perhaps, you have been considering making a capital gift to the Foundation. if your original need for which you took out the policy no longer exists. Are your insurance circumstances similar to any of the following? D A business-oriented policy on a business that has been sold. grown up and are independent.
? A debt policy that has since been paid off. sary thanks to recent changes in the tax laws. attended could not recall it. the check came in the mail." (L-r) Sam Goldie and Morris Rapoport. could reach 40,000 this year. with a host of social services. and how much to local needs. was submitted with an appeal to reopen thisfamily's case. tee is currently taking care of this family in Rome. was their participation in the war against the Jews. the required subjects was excellent. though they were professionally inferior. tration. I was fired from this job as well. Jew, let alone a Jew who wanted to leave. future for her in the Soviet Union. what I had left behind. It has been the dream of my whole life. 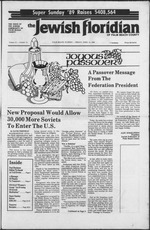 goal of "Passage to Freedom"
On February 22, Michael A.
and learn how to live as Jews." the UJA Board of Trustees. language, participated in the school's first Hebrew spelling bee. The participants included children in Uth, 5th, and 6th grades. Kandel, third place winner Raphael Bensimon, Shoshana Sharf. Not pictured are teachers liana Burgess and Yael Zion. emergency services and urgent programs for Soviet Jews and their families. struggled for their freedom a feeling of joy and accomplishment. medical care, job training and Jewish education. freedom. Now we must help them begin to live it. partnership service for American Jewish communitif*. special group of Jewish people. ties in need all over the world. holiday in the Jewish calendar. cent in January and February. of his or her making aliyah,"
by someone or have a job offer. nam m > "" "?w.i. Each book contains a bookplate which bears the name "Joint"
Law with worldly occupation" (Aboth 2,2).
. well, you get the idea. Passover than during the year. line of other Passover foods. cherished of all the Jewish holidays. take part in this ritual. desire to present new dishes that carry on the tradition. with matzah balls, roast veal, a vegetable dish and dessert. and refrigerate overnight. When cold, remove layer of fat. gently boiling water flavored with instant chicken bouillon. balls with a slotted spoon to chicken soup. Heat soup and serve. to chicken soup. Heat soup and serve. (20 to 24 balls). style; tie the roll securely with kitchen string at 2-inch intervals. high heat; brown veal lightly on all sides. Remove from heat. Sprinkle roast with paprika. Add vegetables to bottom of pan. from bottom of roaster to make gravy. Add chicken stock. 1 tablespoon of cold water. (8 servings). In a Dutch oven, over medium high heat, brown brisket in oil. more Best cooked a day ahead and reheated. (8 servings). wind and break their diets"
your holiday recipes for mere flovor and nutrition. \ over $408,000 in one day.
) ou're on the air." Sunday in five seconds or less ..."
way is the camera anyway?" "On your mark get set call!" are technically still at war. the Gaza Strip, he said. Response to Teens in Crisis,"
Ave., New York, N.Y. 10010.
ognized in North Palm Beach county as the "Jewish Thrift." the JCC Thrift Shop, are now endangered for lack of funds. volunteers to work the shop. man, 471-1077, or Steve Kaplansky 689-7700.
was the result of epilepsy. signed in Israel last month. dent, said in a joint statement. has something so tiny mad* it so big. IF the reunion of S.S. St.
on May 13, 1939, the S.S. St.
Louis set sail for Cuba. to Cuba took about 12 days. did, it was not in Cuba. ship was allowed to come. only 936 meYnbers of the St.
to be admitted to Cuba. day and he baked her a cake. grateful to be here in the U.S.,"
Karliner said. "But if the U.S.
of our family would be here." Some 3,000 "solo seder kits"
last two days of Passover. and 11 in the Air Force. ate for all Jews in the military. them are in need of repair,"
Competitive tat and nicotine levels reflect the f TC method. of representatives of 35 of the become a"yearly event? out details is a "monitoring"
Soviet Union will remain open. County for the past 12 years. 100th birthday of Adolf Hitler. to the attention of the world? "Feel foe personal touch of professionals with 30 years of experience." vice is just for you!!! Thursday, May 1 at 1:30 p.m.
tions. All singles are invited. p.m. at JCC Senior Center. taking second place in 1989. Shirly Weiss and Lucy Cooper. thur's Vineyard (4431 PGA Blvd., at 1-95). with us and bring a friend. Cost: $5 per person. only, JCC members $3; non members $4. For more information please call 689-7700.
ment of Employment salute to Seniors. Senior Center was the alternate. studies in September of 1989.
per person for the luncheon. intersection of U.S. 1 and N.E. Irolh-r ,,f the City of New York. Israelis rolled back at them. more so than other nations. dirty solution to the problem. used to shatter car windows. of Israel for over forty years? Jews. And many of us don't. reach people like Steve does. Aitz Chaim, board, 9:30 a.m.
City of Hope, Luncheon at the Royce Hotel, noon. Adult Division, Social Committee, 6 p.m. Rabbi Leonid Feldman of Temple Emanu-El. the new curriculum, said Dr.
Cantor Abraham Mehler. Services Friday 8 p.m., Saturday 9 a.m.
Daily minyan 8:15 a.m., Sundays through Fridays. Funeral Chapel. West Palm Beach. JACOVES. Yetta, 84. of Lake Worth. eral Chapels. West Palm Beach. MARKS, Louis. 77, of Lake Worth. Funeral Chapel, West Palm Beach. RALPH. Aaron. 77, of Lake Worth. day, April 14 at 8 p.m.
6:30 p.m.; dinner, 7 p.m.
plague of leprosy be healed in the leper"
the purification of the leper after he is healed. when it is unclean, and when it is clean; this is the law of leprosy"
SOBOL, Oscar J.. 78, of Boca Raton. in Egypt, waiting for freedom. tion or another, he will fall. festival of the Jewish People. Senior Transportation available at a nominal lee. Look what under $40 a month covers! Valid for pre-ai rangement only. international rates brochure 1 MO 4000.